Booboo (Bruna) getting cozy in a kitty cube. 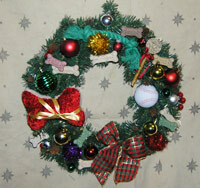 Introducing, our wonderful new DOGGIE WREATHS! 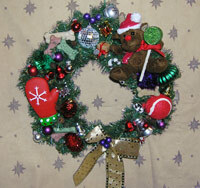 Our Kitty Wreaths were such a hit, we decided to create these for our Canine Comrads. 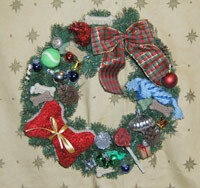 Each wreath is topped with a beautiful fabric bow & adorned with colorful dog toys, dog biscuits, red & silver bells, pine cones, mini presents & candy canes, red berries, & other festive ornament. 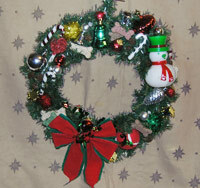 Each 24" wreath is handmade in the USA by our creative tean of rescue volunteers. 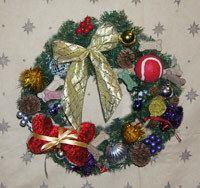 Each wreath is unique, no two are the same. 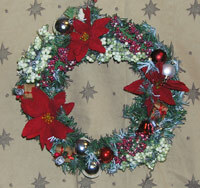 We ship using recycled materials whenever possible.